Though we're still one day away from the big Nintendo Switch presentation, some of us are already prepared to throw down cold, hard cash for the mysterious console/handheld combo. A select few in New York City might actually be able to do just that, as the official Twitter account of Nintendo's NYC branch announced it's ready to take a limited number of Switch pre-orders as soon as this Friday. There's no telling yet if other Nintendo store locations (or other major retailers, like GameStop or Amazon) will follow suit on Friday, though we've asked a Nintendo representative for just this information, and will update this story if more details are forthcoming. The use of "limited quantity" in the tweet is worrying, as it implies eager Nintendo fans may have to get in line pretty dang early on the chilly streets of the Big Apple just for a chance at a Switch pre-order. 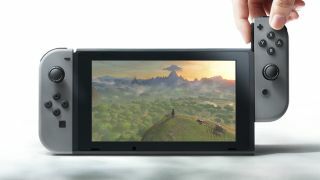 Given Nintendo's reputation of late for under-producing stock to drum up scarcity (see: the NES Classic Edition, amiibos, the infamous Nintendo Wii launch), this isn't an auspicious omen for anyone hoping they could just walk into a store this March and pick up a shiny new Switch. That's just us being cautious, of course, and we hope to learn more about the Switch - to include pricing and pre-order information - during Nintendo's presentation this Thursday at 8pm PST/11pm EST/4am GMT Friday.